UniFirst Corporation (NYSE: UNF), a North American leader in providing customized work uniform programs, corporate attire, and facility service products, in partnership with 12-time NASCAR Cup Series champions Hendrick Motorsports, is gearing up for the 2019 racing season with the unveiling of an updated paint scheme for the No. 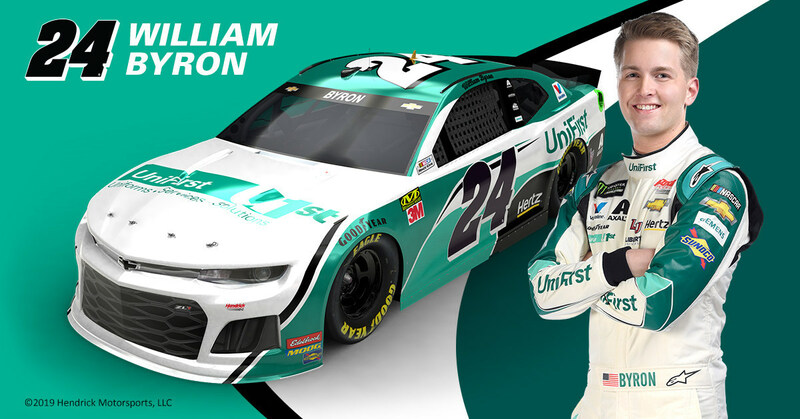 24 UniFirst Chevrolet Camaro ZL1 driven by 2018 Cup rookie of the year and 2019 DAYTONA 500 pole winner William Byron. UniFirst will be the primary sponsor of the Hendrick Motorsports No. 24 Chevrolet Camaro ZL1 with driver William Byronfor three races in the 2019 NASCAR season. The refreshed paint scheme for the UniFirst Chevy racecar features innovative graphic designs with the company's signature green and white colors, black accenting, and UniFirst's corporate logo. The car will make its debut at Kansas Speedway on Saturday, May 11, at 7:30 p.m. ET, televised on FOX Sports 1 (FS1). The next race for UniFirst will take place at Charlotte Motor Speedway on Sunday, Sept. 29, at 2:30 p.m. ET, televised on NBC. The third race will be at Kansas on Sunday, Oct. 20, at 2:30 p.m. ET, televised on NBC. The 2019 NASCAR season begins Sunday, Feb. 17 with the 61st running of the prestigious Daytona 500 (2:30 p.m. ET on FOX) at Daytona International Speedway, where Byron will start from the pole position. At 21 years old, he is the second-youngest driver in history to earn the pole for "The Great American Race." In 2016, UniFirst and Hendrick Motorsports announced an eight-year partnership that runs through the 2023 NASCAR season. UniFirst is also the official workwear provider of Hendrick Motorsports, supplying work clothing and uniforms to the team, and its sister company, Hendrick Automotive Group, which is the largest privately held retail automotive organization in the United States. "UniFirst and our thousands of employee Team Partners around the world are ready for another great season of NASCAR with William Byron and our No. 24 car, which has a slightly different look than last season. Our race car is looking better than ever," says Adam Soreff, director of marketing and communications for UniFirst. "We're also very proud of our driver, William Byron, who claimed the 2018 rookie of the year title and will start from the coveted pole position on Sunday at Daytona. All of his UniFirst fans are excited to cheer him on as he enters his sophomore year of racing in the Cup Series." "I'm excited to have UniFirst back on our No. 24 Chevrolet Camaro ZL1," Byron said. "It's a really clean paint scheme with colors that always stand out on track. It's definitely a great-looking race car. Last year we had UniFirst on the car for a couple of our best runs, and I'm excited to see what we can do this year when they're onboard." In 2018, Byron became only the second driver to win rookie of the year honors in each of NASCAR's three national series in consecutive years – winning titles in the Cup Series in 2018, the Xfinity Series in 2017 and the Gander Outdoor Truck Series in 2016. Byron was named the driver of the No. 24 Chevrolet in August 2017.